12" x 16" | 14" x 16"
16" x 16" | 12" x 18"
14" x 18" | 15" x 18"
12" x 20" | 14" x 19"
12" x 22" | 13" x 19"
. 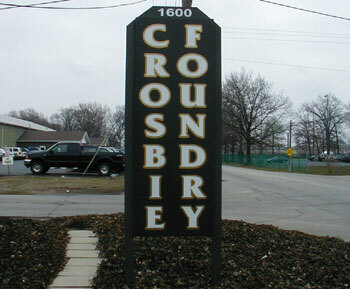 : Crosbie Foundry has been family owned and operated since 1956. We started out supplying polished musical instrument keys to local band instrument manufacturers. We now specialize in producing castings for fire fighting equipment, key blanks, clamps, valves, plaques, signage, and decorative hardware. We pride ourselves on keeping our customer's lead time to a minimum (2 to 4 weeks on average).
.: Crosbie foundry has provided signage for the following U.S. Open golf courses: Pebble Beach, Oakmont, Olympia Fields, Medinah, Winged Foot, and Torre Pines. For the PGA Championship, we have supplied signage to the following golf courses: Crooked Stick, Valhalla, Medinah, Winged Foot, and Atlanta Athletic Club. Crosbie Foundry has also provided signage to Augusta National Golf Club and to Turnberry Golf Club for the 2009 British Open. A key to the City of Elkhart was recently presented to President OBama - these keys are produced at Crosbie Foundry. Web site contents © Crosbie Foundry 2006, All rights reserved.